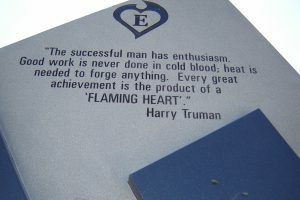 The Effingham Unit 40 Brick Paver Program was created in 1995 to offer a way of recognizing EHS graduates, as well as the teachers, staff, friends, and families of all Unit 40 schools. Individual pavers come in 2 sizes, 4″x 8″ and 8″x 8″. Donors can have their paver engraved with names, dates, activities, records, or quotes, to provide a lasting memory while supporting the Unit 40 Education Foundation’s mission at the same time. To purchase a brick online now, please visit our Brick Paver Online Donation page. To print out and mail in your donation, click on the Brick Paver Order Form. To see some of our favorite brick pavers, visit our Facebook Brick Paver page. 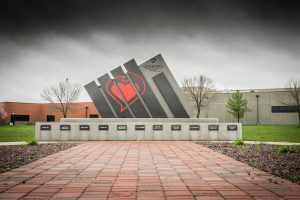 The red brick pavers will be centered around a beautiful marble sculpture designed by Mr. Charlie Huber, EHS teacher, and named “Hand Over Heart.” Located on the EHS campus, the sculpture was generously donated by area businesses and past graduates of Effingham High School. To read Mr. Huber’s thoughts on designing this sculpture, see the Artist’s Inspiration. Funds generated through the purchase of pavers will be administered by the Effingham Unit 40 Education Foundation to award more scholarships and teacher grant requests. Please join me in donating toward this worthy endeavor and celebrate the rich heritage of education we have at Effingham High School and Unit 40. Your gift is tax-deductible and appreciated by so many.